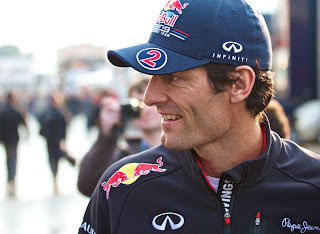 It was overshadowed somewhat by the time the race had ended, but early in the Silverstone weekend the talk of the town was Mark Webber confirming that this year will be his last in F1, as he's off to drive for Porsche in sportscars from 2014. It's wrong to call it a retirement; he'll still very much be active in LMP1 which is a formula on an upward curve right now. And while the man himself is clearly content with his decision I for one cannot help but feel a tinge of regret at his loss to F1. Part of this is that drivers of Webber's quality are not two-a-penny. While even the man himself would likely admit that he is not consistently of the quality of an Alonso, a Hamilton, a Vettel, he certainly isn't far off, and very much is at the top of the next tier of talent. And as we know there are those occasional weekends when Webber is really on form and then absolutely no one can live with him - not even the haughty names I mentioned. We can recall such days: Germany in 2009, his debut win; Spain and Monaco in 2010; Silverstone last year, and indeed his aggressive drive last weekend at the same venue was very much among them, rising from P13 nearly to win. But the main reason I'll miss Mark Webber is to do with his personality. To borrow from something Martin Brundle says from time-to-time, racing drivers these days have a rather atypical, perhaps even a rather sheltered, existence and from an early age: in most cases they've never sat in a job interview or gone through any of the other character-building experiences that the rest of us do. And perhaps it shows: while my admiration of anyone good enough to get into F1 is extreme, perhaps the situation I've outlined contributes to something of an overgrown child personality manifesting among them a lot of the time. Pretty much uniquely, such a charge could not be laid at Webber's door. Almost alone among his F1 driver contemporaries he comes across as someone mature, adult and blessed with perspective, someone who's had to fight against the odds to be where he is and do so without much help, someone who we can relate to. Indeed, the man himself showed this at Silverstone, noting that despite reaching the very top of his profession, 'I'm very proud of where I've come from, I don't forget the street that I grew up in in Australia'. If Webber is indeed the last of a generation among F1 drivers on this, it seems a terrible pity. Its so sad that Mark Webber didnt win the Championship once. I reckon he deserved to. And that Jawline ! I'd give an arm for a Jawline like that in place of my double chin ! I am an Australian F1 and motorsport fan myself so obviously it will be sad to see him depart the open wheels. He was deserving of a world championship and,it would have a been great to see him to do it this yr for what slim chance is left.